Spring is upon us and we all feel the effects of a long soggy winter. All that liquid sunshine might bring relief to those of us who worry about drought conditions but recall that less than six months ago more than 2/3 of Oregon counties were declared as drought emergencies. Sure, the rain and snowpack helps but let me put a fine point on it – this is what Oregon drought conditions looked like a couple of months ago after all that rain. Yet there are still over 400,000 Oregonians living in drought areas according to the United States Drought Monitor (data represented in image below). While 2016 snowpack levels are higher than average in some parts of the state they are still lower than average in others. You may be optimistic for good summer water conditions and might even believe that drought emergencies are a thing of the past. You might even think that Oregon has enough water now, right? No. It doesn’t. We know that water is the new gold and this is what has motivated groups like the Local Water Alliance and groups in the Keep Nestle Out of the Gorge Coalition to keep up the work of not only keeping Nestlé out of Oregon, but of permanently protecting Hood River County water from any commercial water bottling. All this work has gotten us some great attention. In fact The Story of Stuff is making a film to help us tell the story of what Nestle wants to do with water that belongs to Oregonians. The film will be available to the pubic starting on World Water Day, March 22nd 2016. It will show you that Nestlé’s business practices are greed-based and environmentally negligent, and it will also show you what communities can do to stop multinational corporations from abusing common public resources, like water. Perhaps the thing that is most exciting is that this film is optimistic. Oregonians are not alone in the fight to save our water, we stand by fellow defenders of water in communities throughout the country as far away as Maine and as close as our California neighbors. Winter also provided many opportunities to make things happen locally too. The enthusiasm from Hood River County residents has been overwhelming and we look forward to a successful ballot measure passing in May of this year. The May ballot measure to Protect Hood River County’s Water will not only Stop Nestlé’s bottling proposal in its tracks it will also prohibit any commercial water bottling in Hood River County. Between then and now, there is a tremendous amount of work to be done as the Local Water Alliance continues to lead that effort. With the passage of that measure, Hood River will have made history and set a model to be used by other communities to help protect their resources too. But what’s next for Oregon, you ask? Groups involved in the Keep Nestlé out of the Gorge Coalition are communicating with both Governor Brown’s staff and the head of her Water Resources Department to ensure that the state develop sensible policies on how public water resources should be managed moving forward. After the governor’s request to the Water Resources Department to develop a policy to better handle private companies or individuals requests to access state held water rights; we will work hard to make sure the public’s interest trumps private corporate greed in the development of that policy. In the mean time what you can do to continue to support these efforts ranges from contacting the Water Resources Department and Governor Kate Brown’s office encouraging them to make state water resources off limits to corporate water bottling. If you want to get further involved in the ballot measure campaign you can make a donation to the Local Water Alliance. The Local Water Alliance and citizens of Hood River County are taking on one of the wealthiest most powerful multinational corporations in the world; they will need financial support to win. If you are interested in doing more than just writing a check you can also sign up to host a house party. The campaign will help you set it up and will send someone to speak at your event. Pamela Larsen, one of the three chief petitions carried the box of some 1,600 petition signatures to the County Elections office today to qualify the Hood River Water Protection Measure for the ballot in 2016. Local Water Alliance (LWA) Director Aurora del Val (middle) and campaign organizer Molly Kissinger (left) along with a dozen Hood River County citizens participated in today’s historic delivery. The LWA is running this precedent setting ballot initiative campaign. The precedent-setting citizen ballot measure that would block Nestlé’s proposed water bottling plant in the Columbia River Gorge and prohibit commercial water bottling in Hood River County took a major step forward today as campaign backers turned in over three times the 497 signatures needed to qualify the measure. Local Water Alliance (LWA), which is spearheading the campaign, collected more than 1,600 signatures in just over a month, making it virtually certain that the county will qualify the Hood River County Water Protection Measure to go to county voters. Campaign backers argue that it does not make sense to send more than 200 million gallons of water each year out of a county that has been in a serious drought. Want to support the campaign? Make a donation and get a perk from their Indiegogo fundraiser. Just days after the Umatilla tribe came out in opposition to Nestlé’s water bottling plans for the Columbia River Gorge and a week after citizens of Hood River County began gathering signatures to qualify a water protection measure to protect county water from water bottlers, Governor Kate Brown changes her tune on Nestlé. 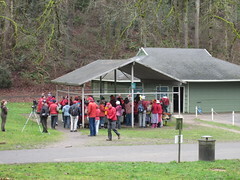 Upon hearing that Governor Brown sent a letter to the Oregon Department of Fish and Wildlife asking that the agency pull out of the current water rights swap and go back to a process that at least requires a public interest review the Local Water Alliance (LWA) a citizen group based in Hood River County applauded her decision. 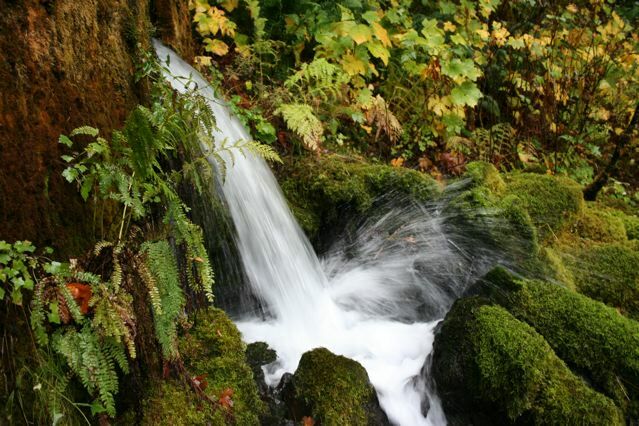 Because adding a public interest review back into the ODFW process being used to consider whether to allow state-owned spring water to be used for a bottled water plant being proposed by Nestlé in Cascade Locks, OR is a huge step in the right direction. 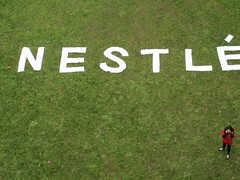 According to the LWA and other groups opposing Nestlé’s water grab, there is no credible way the Nestlé project could be found to be in the public interest. The LWA is calling on Nestlé to abandon plans to export water from Hood River County, which has been under a formal drought declaration since summer. The LWA objects to the Nestlé project, saying that allowing Nestlé to export water from a county with a formal drought declaration would set a dangerous precedent that threatens the long-term water security of Hood River County. LWA is currently collecting signatures on a county ballot measure that would block Nestlé’s plans for a bottle water plant and prohibit commercial water bottling in the county all together. “A state public interest review is good, but come election day Hood River voters are looking forward to giving Nestle a public interest test of our own,” adds del Val. 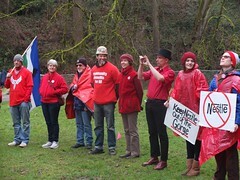 Members of the Keep Nestle Out of the Gorge Coalition including Food & Water Watch and Bark support the Local Water Alliance‘s ballot measure that would protect the entirety of Hood River County not just from Nestlé but from all potential water bottlers. This action from the governor’s office clearly shows us that this is an issue that warrants leadership from the top and it’s heartening to see the governor finally take at least some ownership over the issue of how this increasingly scarce public resource, water, should be used in the state of Oregon. Anna Mae Leonard’s 5-day fast ends today, Aug. 21st. She is protesting Cascade Locks plan to sell Oxbow Spring water to Nestlé. fast without water or food in front of Cascade Locks City Hall to protest the city’s plan to sell public water to Nestlé for a proposed water bottling facility. Leonard is a Cascade Locks resident and her tribal ancestors have been fishing on the Columbia for hundreds of years. She represents the Unchee Wana Fisher People Against Nestlé: a group of tribal fishing people who strongly oppose Nestlé’s intent to bottle Oxbow Spring water – the spring is a culturally significant and sacred site to tribal members in the Columbia River Gorge. Leonard along with hundreds of Native Americans in the Gorge think the water rights swap is a violation of the 1855 Treaty. 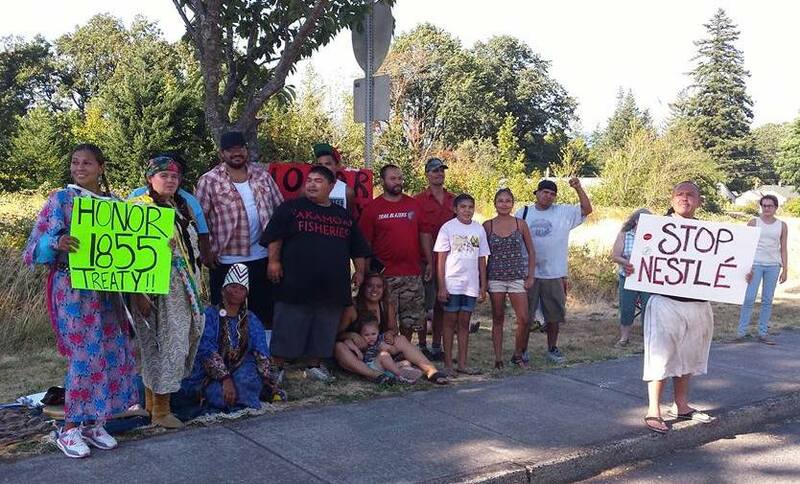 On Wednesday this week dozens of Native American fisher people and Gorge residents joined Leonard in an evening of solidarity. Local opposition to Nestlé’s water grab is mounting in the face of drought conditions, rampant wildfires, and a clear need to protect public water for people and wildlife, not to sell off to private corporations who intend to make this precious resource into a commodity. 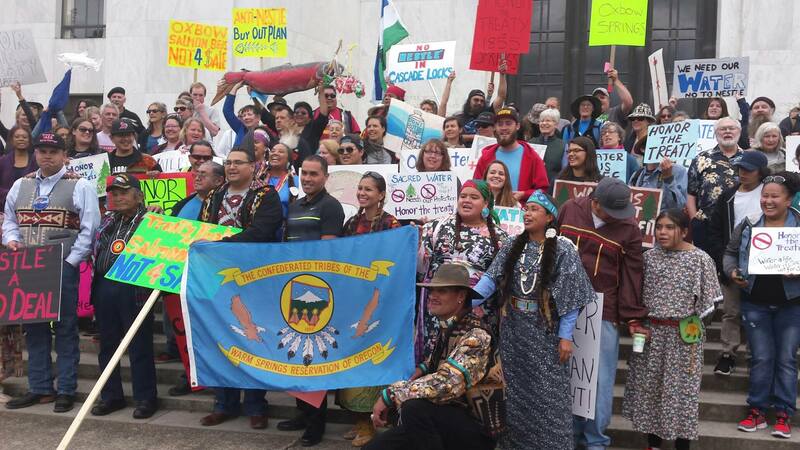 Leonard has told the press that she and many tribal members are fed up with the lack of action from top leaders in the state like Governor Brown and the Oregon Department of Fish and Wildlife. Leonard’s powerful fasting protest ends today, but throughout the week she has been visited by supporters from the Gorge and has received positive feedback from the locals and tourists passing her by on Wa Na Pa Avenue with thumbs ups, waves, and affirmative honking of car horns. Leonard has expressed surprise (as heard on KPAM’s Mark and Dave Show August 20, 14 minute mark) at all the support she has been receiving. After learning about the water bottling proposal only a few months ago she started asking around to see if other native fisher people had heard about the proposal and if they were doing anything to stop it. She found out that most had no idea Nestle intended to bottled Oxbow Springs and those that did know thought there was nothing they could do about it. One thing they all had in common was strong opposition to the city of Cascade Locks obtaining rights to Oxbow Spring water so they can sell it off to Nestlé. Ever since Leonard found out that Warm Springs tribal leadership had submitted a letter to Governor Brown expressing opposition to the state’s role in making Oxbow Springs water available to Nestlé she’s been using it as a rallying tool. She has gathered hundreds of signatures from native fisher people calling on the governor and state agencies to stop the water rights transfer deal that would let Nestle open up shop in the Gorge. 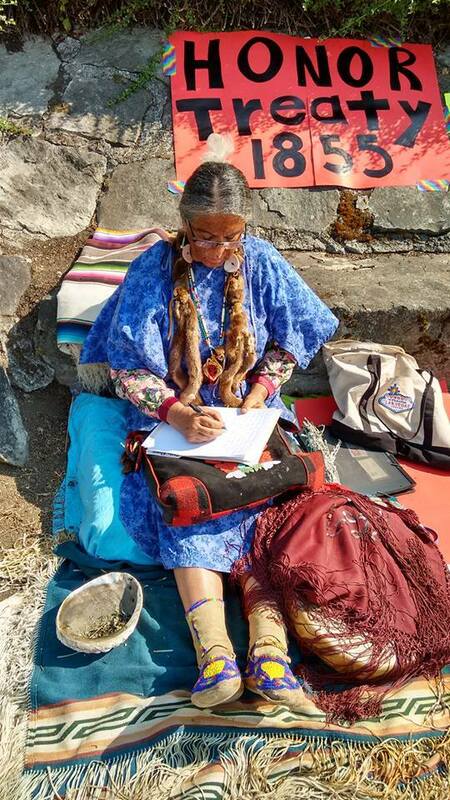 To ramp up support of her efforts she decided to perform a 5-day spiritual fast in full view of Cascade Locks city leaders, to both pressure them to do the right thing and to raise awareness to her people and the world that sacred water resources should not be for sale. Solidarity action on Wednesday the 19th. 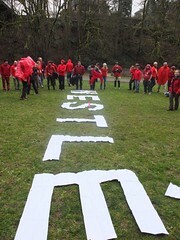 Here Anna Mae stands with fellow fisher people demanding a stop to Nestlé in the Gorge. Leonard told the Oregonian reporter: “I want the [Cascade Locks city] council to think about what a world would be like without water…I want them to look at me suffer and think about how the fish will suffer without that cold spring water.” Lets honor her suffering by keeping up the fight to protect the Gorge and this sacred water from Nestlé. If you are a Cascade Locks resident you can call your city council here: 541-374-8484. If you want to express your support of city council member Deana Busdieker’s opposition to Nestlé please email her. To contact the Governor to express your concern about her lack of action to protect this public water from Nestlé, please call or email her at 503-378-4582 or on her share your opinion page. 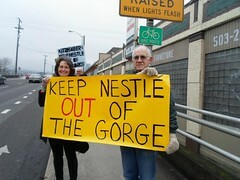 You can keep close track of this issue by joining the Keep Nestle Out of the Gorge Facebook group. You can check out all the press Anna Mae Leonard’s protest has received by clicking on our “In The Press” tab. Will Governor Brown do her part to protect this spring water from Nestlé? “Water Awareness Month.” She even issued a press release about it. According to a July 6 Statesman Journal article, “Oregon Gov. Kate Brown will order all state agencies to review their water usage and implement conservation plans in the face of the state’s growing drought.” She also urges individuals to do what they can to conserve this precious resource. In letter responding to nine Oregon State Legislators who expressed concerns over Oregon Department of Fish & Wildlife’s (ODFW) role in Nestlé’s water bottling proposal in Oregon, Gov. Brown makes clear that she doesn’t think the Governor’s office has any role to play in the matter. Strange, since ODFW’s initial consideration of the proposal six years ago was at the direction of Governor Kulongoski. Clearly there’s a role for the governor to play in preventing a state agency tasked with protecting fish and wildlife resources from making public water available to a multi-national water bottling company. Call the deal a water exchange or call it a water rights swap; no matter how you slice it Governor Brown’s state agency, the Oregon Department of Fish and Wildlife – if Brown allows it to proceed – would set a dangerous precedent by voluntarily initiating a complicated process to make public water available to Nestlé. Currently not one of the 33 water bottlers in the state of Oregon procures that water through a public state agency; why should the State allow Nestlé to do so? The deal has never made sense for Oregon, but now that Cascade Locks has new economic development options, Hood River County is seeking drought emergency status, and public concern is mounting both in the community and across the state, it’s clearer than ever that Nestlé is a raw deal for Oregonians. Nestlé’s water bottling plant has no place in Oregon and state agencies should play no role in opening up the door to a company that continues to pump millions of gallons of water out of California during a historic drought. 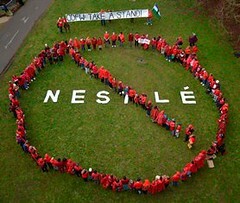 And, Nestlé’s CEO publicly stated he would pump even more water out of California right now if he could. Governor Brown understands climate change; it’s one of her main reasons for proclaiming July Water Awareness Month. She knows water scarcity is in our future. No matter how you look at this, the deal will lead to 118 million gallons of water per year being removed from a watershed in a drought-stricken county. The math is simple: if Governor Brown is serious about state agencies conserving water the only thing to do is tell ODFW to stop any and all water transfer applications pertaining to Nestlé’s water bottling proposal.